A tough result to take for the ladies against a team that they beat 9-1 three weeks ago. A combination of players missing, a little complacency, York having players return and numerous efforts that just would not go in saw York win 2-0 after scoring from a free kick that should have been stopped late in the first half and a last minute 2nd when the Owls were throwing everything plus the kitchen sink at the York goal. 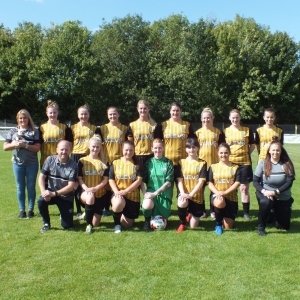 This was a game that the opposition manager said that he couldn’t believe they had won after our ladies had the lion’s share of the possession and more than enough chances to have won the game comfortably. Two games and two wins so far for our young Development team. They saw off Mexborough 5-1 after leading 3-1 at the break and for the time being sit on top of the table. Scorers: Tia Stancill (2) Elise Swallow & Caitlin Roberts. Sorry for the late round up (it’s been a very busy week) but last Saturday we had all 9 junior teams playing in games which included 3 Steel city derbies. Our U9’s faced Sheff Utd away at Grange park in the first of the day’s derbies. The U10’s were also away but at Penistone Church and our U11’s hosted Sheff Utd White in the second of the days derbies at the SHU Sports park. Unfortunately, I won’t be reporting on any “smiling faces” “sad faces” or “indifferent faces” for our 3 youngest teams as the FA are clamping down on any sort of reporting on the U11’s and younger and fines will be issued. All I can say is we have three great sets of players and parents and it great to see everyone so positive and enjoying being part of the team and SWLFC. Our U12’s (who we can report on this season) had a great 2-0 win away at Dronfield Town, the teams were level at half time with 2 goals from Christiana Smith and a good team performance resulting in the 3 points. Our U13’s were hoping to add to the 3 points they gained last week but had a tough game against Huddersfield Town. It was a case of a bad day at the office with Town leading 2-0 at the break and the game finishing 3-0 and Huddersfield deserving winners. The U14’s ran out comfortable 11-1 winners when they played hosts to Crosspool. Scorers on the day were Alisha Attwood (4) Lily-Mae Beevers, Brooke Betts, Madison Wilson (4) & Imogen Yeardley. Another 3 points for our U15’s who beat Worksop Town 4-1 away with scorers Neve Renwick, Charley Taylor & Lucy Robinson and an OG. Our U16’s finally got their season up and running hoping to defend last season’s double winning achievement’s. They faced Sheff Utd red in a tough game and after being stalemate at the break (1-1) the game finished all square and 2-2 in the final “derby” of the day. Scorers: Millie Simms & Delia Hurdiss. Last but not least Kyle and the U18’s played out a 5-2 victory over Doncaster Belles with 4 goals coming from Hannah Jackson (4) and Daisy Parry.